STEFF ROCKNAK — What Is It Like to Be a Philosopher? I was born in New Jersey, and then moved to Jefferson, Maine when I was six years old. Jefferson is a small village on a 4,600 acre lake about mid-way up the state. At the time, it had a population of about 1,400 people. No stop lights, but we had a small grocery store, a post office and a hardware store. What was your family like? Religious household? My family was very creative and not especially religious (two older brothers and my mother and father). There was never a point when at least one of us was not making something, or trying to solve some kind of physical or mechanical problem. For instance, my mother might have been making an intricate sweater or a cloth doll, or my father might have been working on the house or the two barns. Meanwhile, my brothers might have been fixing an engine. Or, any of the kids, including me, might have been drawing or sculpting or making something out of wood. Paint-by-numbers and coloring books were forbidden; my father had me drawing from life at a very early age. What materials would you sculpt with? When I was very small, I worked a bit with clay, but for the most part, I have always worked with wood. My father and I carved a human head out of oak when I was twelve, and I made my first wood sculpture when I was 22. Mostly though, until graduate school, I worked in two dimensions—I drew a lot. It was readily available in Maine! Cool. What did your parents do for a living? What do your brothers do now? Up until I was six years old, my father was a high school art teacher. After we moved to Maine he worked as a cabinet-maker for a while, and then he started a business selling sailboats. My mother worked at this business as well and my oldest brother still does (along with doing computer graphics, e.g. he helped me tremendously with my recent bid to create a memorial in Washington, D.C.). My other brother is the owner and producer of a car-collecting magazine. He is also a photographer. As a little kid, what were you interested in? Art, animals (although I am allergic to almost all of them), reading, and spending time on or near the lake, but not necessarily in that order. As a teenager, did you get into any trouble? I did not get into much trouble as a teenager. I was pretty much a dork, and hung out with my dorky friends—who I loved. We generally spent most of our free time at the arcade. I got pretty good at Centipede and Donkey Kong. In fact, this fall, I’m teaching Philosophy of Gaming to students who are, most likely, contemporary gaming experts. It should be an interesting class; I look forward to re-visiting my now-ancient interest in gaming. Well, that sounds like the best thing ever. I’d love to take that class. Where’d you get the idea to teach the class? Thanks! I think the idea grew out some of the discussions we have had in my Philosophy of Mind class. Gaming seems to come up a lot when we start thinking about Artificial Intelligence. My students and I also inevitably discuss gaming in my aesthetics classes—is it an art form or not? What books and articles are you using? It’s an intro course, so we are using Cogburn and Silcox’s Philosophy Through Video Games. Favorite subjects in high school? Sports? I have say that art was my favorite subject, although I loved to read and I enjoyed math. I did not read any formal philosophy until college, and it was on my own. I also ran cross-country and track. I was infatuated with Jim Morrison and The Doors. I’m down with The Doors! Favorite book in high school? The two books that I remember the most from my childhood where Watership Down and Gone with the Wind, which I read in third grade. After that, I was a voracious reader, and mostly read my parents books. Odd though, that I can’t really recall an especially favorite book from High School, although the Russian Literature class that I took still resonates with me: Tolstoy, Dostoevsky and Gogol are remarkable. Loved the nihilism of Russian literature. What drew you to Russian literature? It may have been the brutal honesty. Yes! What would your teenage self-make of your current self? If you could give yourself advice back then, what would it be? What do you mean by internalized misogyny? I am referring, generally speaking, to the harmful views that some women have towards other women and themselves. Members of oppressed/repressed groups often unwittingly become the stereotypes that are misleadingly meant to characterize them. Think for instance, of the lead female character in the series “The Marvelous Mrs. Maisel.” This is a terrific narrative about a woman who wakes up, and shakes some of the stereotypes off. Don’t get me wrong, I was never a “girly girl,” in fact, I think I subconsciously became a “tom boy” to stave off the stereotypes. Did you start thinking about what you wanted to do in college, if college was even on the table? What was the plan? When I was a senior in high school, I wavered back and forth. Some days I thought I would go on to major in economics and work on Wall Street (still pushing that conservative agenda). And other days, I thought I’d find a way to make a living doing art. What was going on in the world at that time? The threat of nuclear war always seemed to loom large. And these were the Reagan years; the more I watched the news, the more the scales fell from my eyes. I was turning away from social conservatism. Where did you go to college? Was it what you expected? I went to Colby College (both of my parents graduated from Colby as well). I loved it, and it was more than I what I expected; I’m still friends with a number of the people that I met there. I played varsity ice-hockey, which is probably what I enjoyed the most; I very much liked being on a team. Now that I think about it, it seems like I have always been drawn to activities that require the participants to wear a helmet, and/or protective gear, e.g. ice-hockey, biking, motorcycling, scuba-diving, sculpting, skiing, and of course, professional philosophy. My favorite class was probably the January Class I took on William Faulkner. Faulkner is, I think, one of the best examples of postmodernism on the docket—better maybe, than any post-modern philosopher. Very generally speaking, the reader can experience meaninglessness and despair through his work, rather than be told about it. Think of the Benjy sections in The Sound and the Fury. Later, I would come to realize that postmodern philosophers like Nietzsche and Heidegger (broadly speaking) attempt to do something similar, but they inevitably fall short. Try as they may to do otherwise, they always end up talking about these matters. Only an artist (like Faulkner) can allow the reader/viewer to see what it’s actually like to be a postmodernist, to experience it, as say, Benjy would—to really try on the insanity for a bit, so to speak. I am not a postmodernist btw, but for a brief period I was interested in its motivation and its expression, at least in regard to art-making. When did you realize finance was not your bag? What did you major in and why? I ended up majoring in American Studies, Art History, and minoring in Painting. I discovered I was more interested in the humanities than finance. Who’d you hang with? Did you party? I hung out quite a bit with the hockey team. The season started in November and ended in March. We usually practiced for about 2 hours a day, ate dinner together, and had a game every week. So we spent a lot of time with each other. But I had a group of other friends as well, some were associated with the American Studies major, and others were Econ majors. And yes, I did party. Quite a bit. I’m afraid that the hockey team was notorious for that. Were you still doing art? Yes, and after spending a semester in Rome during my junior year in college, I knew that I wanted to sculpt. In college, how did your political thinking evolve? Almost all of my friends were socially liberal, so I was able to work my out many of my ideas with them. I’d say I was no longer conservative by the end of my first year. Many of my professors (male and female) were feminists as well, which was very inspiring, encouraging and challenging. Did you start to root out your internalized misogyny? As the veil of social conservatism fell away, so did a great deal of my pre-conceived of thoughts on what it meant to be a woman. Did you encounter sexism in college? Yes, of course, and as far as I know, everyone did to some degree. Noteworthy example or examples? Some people ignore it. Some people speak up. How did you deal then, and how do you deal now? I’m not going to go into details, but like most of my friends, I had to pick my battles. That goes for recent years too, although I have been willing to take on bigger battles. It gets to a point where you’ve just had enough. Right. What did you do after you graduated? Immediately after I graduated from Colby, I moved to northern Japan (Ofunato) to teach English. After doing that for six months, I traveled through South East Asia, partially by bicycle. I wanted to see and experience the aesthetic of Southeast Asia, especially the visual art and the architecture. I had spent a semester in Rome while I was in college, but this was my first time traveling alone. I was intimidated—I distinctly remember looking at a giant billboard of the Marlboro Man as I rode the bus into Hong Kong. Somehow it reassured me while simultaneously making me feel uneasy; the United States was everywhere. 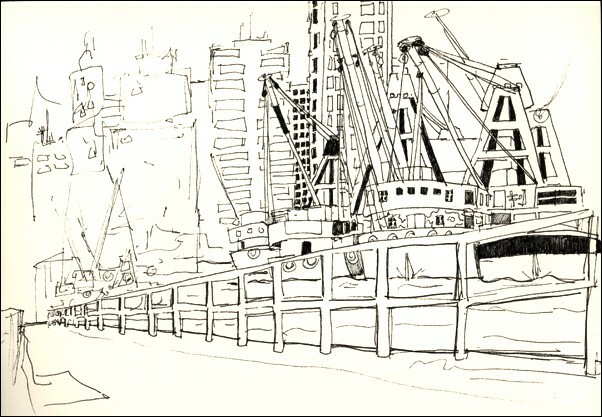 I spent about 10 days in Hong Kong, walking around, drawing and writing in my journal. I also remember reading Faulkner’s Flags in the Dust in a sweaty, dark and incredibly blue hotel room. I talked to virtually no one. I was still somewhat anxious about traveling alone. Singapore was the next stop. It was desperately hot, but the food was good. I remember being surprised by the colonial architecture mixed in with malls, sky-scrapers and an impressive amount of contemporary public art. I continued to draw and write, but I don’t remember reading much—although I do remember watching The Terminator in the hostel’s common area. At least I was talking to people. But my ultimate destination was Bali, I had been dragging my bike with me since I left northern Japan, and I wanted to use it. After I finally got there, I biked around the island for about two months, and continued to write and draw. I was also reading Nietzsche, trying to figure out what to make of certain aspects of postmodernism in relationship to art-making. After some near misses with disaster, escaping thanks only to the kindness of strangers, I sent my bike back to the states and flew to Darwin, Australia. Did you ever figure out the relationship between Nietzsche and postmodernism? Very, very generally speaking: I think that there is a kind of selfishness (narcissism, really) that permeates certain strains of postmodernism. Nietzsche especially. So it was quite a disconnect for me to be reading that kind of thing while simultaneously experiencing the repeated and unsolicited kindness of strangers as I drifted through South East Asia. Theory did not push me away from postmodernism (broadly speaking). People did. I can see that. What was the plan in Darwin? The idea was to get work on a fishing boat, squirrel some money away and continue to travel. And I did get work as a deck hand—for about a week. Luckily the cooling system broke down and we had to turn back. The Captain and his wife were very nice (it was just the three of us on a 60 foot boat). But the Captain made some questionable decisions while we were at sea; apparently, this was his nature. A few days into the trip, I learned that his absent right leg (which I obviously knew about when I signed up) was not due to an unfortunate accident or illness—i.e. something that was out of his control. He told me that he had been in a drunken motorcycle accident in Bali and did not properly care for the resulting wounds. His leg was lost to gangrene. I’ll never forget his calls for help as we limped back into port: “Darwin Radio, Darwin Radio, this is Victor Michael 32…do you read, over?” Darwin Radio never responded. 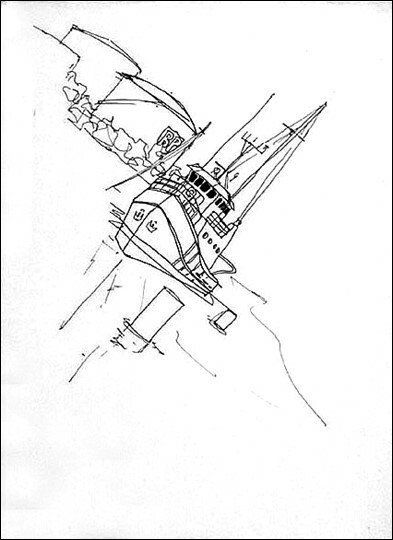 I spent a few days hanging out on the fishing boat in the harbor, drawing and looking for a car headed south. I eventually teamed up with three people and we drove across the outback in a station wagon that had more cooling issues. We broke down at least twice. I remember sweating a lot. I was also reading Perfume, by Patrick Süskind, in between accidentally swimming with crocodiles in Kakadu and marveling at the giant anthills in the outback. And, becoming somewhat terrified by one of the Germans in our group: Franz. After he saw my copy of Nietzche’s Twilight of the Idols in my pack, he told us that he had always liked to sneak into his father’s closet and caress his WWII Nazi uniform. And so on. Verbal fights and cold stares ensued. After arriving in Cairns, we all parted ways with Franz. I ended up finding work as a painter on a large hotel construction site for about 6 weeks. The men that I worked with were great, and odd—one of them could not stop singing show tunes as we worked. I finally ended up in Bangkok, Thailand, and from there, I flew back to the United States. By then, I knew that I wanted to pursue a Ph.D. in philosophy and keep making art. At that point, I was mostly concerned with answering questions that pertained to art—what is it and how should artists proceed? But I did not end up pursuing aesthetics. Why didn’t you end up focusing on aesthetics? I eventually became interested in epistemological questions because I thought they were more primary—I wanted to figure some things out about knowledge before I tackled questions about art. I was particularly interested in the role that the imagination played in regard to knowledge, especially from a historical perspective. Relatedly, I became very interested in Hume’s Treatise and his naturalistic approach to the world and to human nature. Hume rules. What do you dig about Hume, exactly? It was not surprising that I found some relief in Hume’s empirical, and mostly non-polemical approach. I was also attracted to the complexity of the Treatise, especially 1.4.2, and I was fascinated by his dependence on the imagination. I ended up writing part of my dissertation on this, as well as a book: Imagined Causes: Hume’s Conception of Objects. So, after your trip abroad, were you worried you wouldn’t get into grad school? I had never taken a course in philosophy while at Colby, so I applied anywhere where I thought they’d take me. I was lucky enough to be accepted into Syracuse University’s Ph.D. program. After spending a year there, I decided to leave, moved to Boston, and applied to Boston University’s Ph.D. program. BU had a more historical department, and it just did not feel like a good fit at Syracuse. I was accepted the following year, and completed my studies there. Lots of diverse classes, and most of them took history into account. I could also take some higher-level logic courses, e.g. Set Theory with Akihiro Kanamori, and Jaakko Hintikka led a few working logic groups (I also took Mathematical Logic at the Harvard extension school with Gerald Sacks and sat in on his Model Theory class). I did not end up going further in logic though, although it was challenging and fun. I wrote on the constructive imagination in Hume and Quine (in regard to epistemological questions). Jaakko Hintikka was my advisor and he was terrific. Hintikka was always open to new ideas and he seemed to take my work very seriously. While I was at BU, he offered me the position as Editor of Synthese. I turned it down though, it would have taken a tremendous amount of time. As a result, I would have had no time to sculpt. I always wonder, in hindsight, if that was the right decision. I wrote my dissertation while I lived in Southern California with my boyfriend at the time. I spent a lot of time in the UC Irvine library! Hintikka and I primarily communicated via Fax, which was worked out very well. I still have all of his comments in long hand. Sure, we disagreed at times, but in the end, I think we were both satisfied with the final product. Where did you land your first gig? After completing a 10 month DAAD fellowship in Osnabrück, Germany (working on a historical project regarding the epistemological imagination in Kant and Heidegger), I accepted a two year Visiting Assistant Professor job at Connecticut College. After that, I started my tenure track job at Hartwick. How would you describe Oneonta to somebody who has never been? Oneonta is a small comfortable town. It sits on the Northern edge of the Catskills, about 3.5 hours north of New York City. Because of its relative proximity to NYC, it has not been a bad place to live. I also love to ski, and there are a lot of good ski areas fairly close to me. Did tenure change your perspective on the profession? Tenure didn’t, but time spent in the profession did. It’s no secret that there is a dark side to professional philosophy. I’m betting that almost all of us, regardless of gender, rank, location, etc., have experienced some pretty cringe-worthy behavior. But it’s worse for minorities and women—that should not come as shocking news. Got it. So, you have been at Hartwick for a long time. Lots of people jump from job to job. Why'd you stick around? The job market was a grind. So I decided that I wanted to focus on my work instead of jumping around. The 6 course load has been, and continues to be challenging, but I’ve managed to make a number of sculptures and to get some things written. Hartwick’s proximity to NYC has also proved fruitful as far as exhibition opportunities go. You’ve been working with wood for a long time. How is working with wood different from working with other media? Wood, like any subtractive medium, is certainly more challenging than say, an additive medium like clay. In the former case, you take material away, and each subtraction is usually permanent. But with an additive medium, you can constantly make changes and adjustments. So, when working in wood, I need to think very carefully before I make a move; I do a lot of a looking at a piece in between working on it. Like, do you start with a sketch? Where do you find the wood? What are you looking for? Does the piece of wood change your plans? I generally don’t start with a sketch—I work the problems out in the wood. Lately, I’ve been getting my wood from a local saw mill. It’s kiln dried so it does not crack when I’m working on it. The wood does not change my plans, I try to work through everything that happens as I proceed. I have also laminated my last two wood sculptures (“The Queen” and “Gut Check”) to avoid being constrained by the size of the wood (lamination is a process where you glue blocks of wood together). One of your sculptures, “Figurehead,” appeared in the Smithsonian? 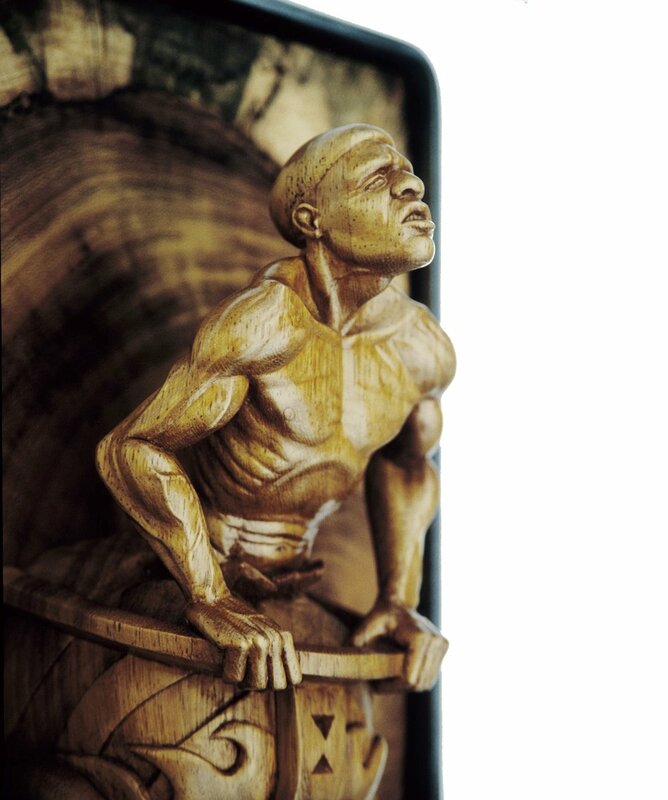 It was included in a traveling show, Captive Passage: The Transatlantic Slave Trade and the Making of the Americas. This show, including my piece, was on display at the Anacostia Museum in D.C. (Smithsonian) for about eight months in 2003. Love your Poe sculpture! What's the story behind that? Thanks. I needed to make something that is specific to Boston. There used to be a train station nearby, so the idea is that Poe is walking off the train towards the house where he was born, which is just a few blocks from the sculpture’s location. With his left hand he is dismissing the “Frogpondians” that he did verbal battle with when he was alive (the Boston Frog Pond is located behind the sculpture in the Boston Common). Poe is coming home, but as a human being; in part, this is why the sculpture is 5’8” tall, Poe’s actual height. The man is not heroic, but his work is—and thus, the especially oversized raven flying from his suitcase. The raven is an immediately recognizable symbol of Poe’s work. You can see some photos here. Reaction, when you saw the Poe sculpture make the cover of the NYTimes? I knew that a story was coming out in the Times because I had been in contact with the writer. But I did not know that it would be a cover story until I picked up a copy on the morning of the unveiling. I was shocked, but of course, I was thrilled. Artistically, what have you been up to recently? Last winter, I was selected as a finalist for the National Native American Veteran’s Memorial in Washington D.C. There were four other finalists/teams. My team’s proposal was on display at the National Museum of the American Indian (Smithsonian), both at the D.C. location and the New York City location. Unfortunately, my team did not win, but if anyone’s interested, our presentation is viewable here. Does your art inform your philosophy? Your philosophy, your art? I don’t feel the need to make philosophical or theoretical sculptures; doing professional philosophy has, I think, freed me from this. I make very obvious, visceral pieces. So the viewer’s reactions should be fairly immediate and genuine, similar to how we might react to certain kinds of body language when we encounter actual human beings. As far as my philosophical work goes, I’m not an artistic-philosopher, like some of the “continental” philosophers, e.g. Nietzsche, Sartre, etc. My philosophical writing style tends to be “analytic”—not much emotion there. In this general respect, my artwork, which is mostly emotive, does not inform my philosophy. Interesting artistic and philosophical projects on the horizon? I do want to start writing about art and art-making, so here’s where my artistic side can play a role, at least from an introspective point of view. I’m also planning on starting a series of smaller wooden figures this fall, but I’m not entirely sure what they will look like. Cool. Do you find any trends in philosophy exciting? Disconcerting? I really try to stay away from trends, in regard to both philosophy and art. Honesty, i.e. taking an honest, genuine approach to doing philosophy and making art is much more important to me. George Saunders is one of my current favorite authors. But it’s just a coincidence that he used to live in Oneonta. I met him once, at the gym. He was very gracious and down to earth. I had been staring at him for while as I ran on the treadmill, trying to figure out if it was, indeed, him. Finally, I worked up the courage to approach him and ask: Are you The Writer? His response: “Why, yes I am.” We both laughed. Nowadays, what do you do in your free time? In the winter, I ski a lot, and binge-watch series on my iPad. I just finished “Ozark,” among other things, it has very complicated and believable female characters. I thought that “Westworld” was also very interesting, although disturbing. Westworld is great. Ozark is fantastic! What was your election night like in 2016? I hear you. Thanks, Steff!